I am very honored to participate in this Metroidvania JAM. "Cyborg Ninja" is an NES-style ninja action game. I and my friend Jia like well known original "Ninja Gaiden" and "Castlevania", So we started trying to combine them two. 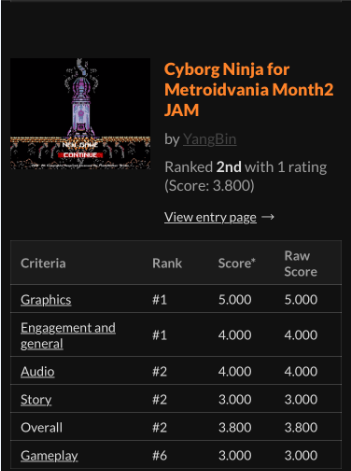 “Cyborg Ninja” is a super ninja-themed game that has “Metroidvania” core experience, You will play a Super ninja with cyborg called Katana, fight against evil organizations, gradually discover secrets. This game was developed with Unity5, and I spent nearly half a month programming from scratch, trying to achieve all the operating mechanisms of " Metroidvania" game， My friend, Zhiyuan Jia, provided me with pixel art support. Due to limited time, we are unable to original all the art resources, hereby declare,We will gradually replace all the unauthorized art resources in the next work. Cyborg Ninja is still in development, The game scene is incomplete, so we didn't make a map for the game in this time, which will be in the full version. In this Jam, I met a friend, RyanUdairam ( this is his page ), A music composer who Wrote sound effects and BGM for "Cyborg Ninja", he is a Passional and Trustworthy guy. Finally, Finally, My team and I sincerely thank you for trying this demo. Dpad Up = Trigger a conversation. Nicely done, any plans to develop further? euh...where is the link to the demo ?